U.N. Envoy - Syria Could Be The Next Somalia : The Two-Way U.N. envoy Lakhdar Brahimi says there's so much warfare that Syria may be broken for years. Meanwhile, British Prime Minister David Cameron suggests Syrian President Bashar al-Assad could be given safe passage out of his country. 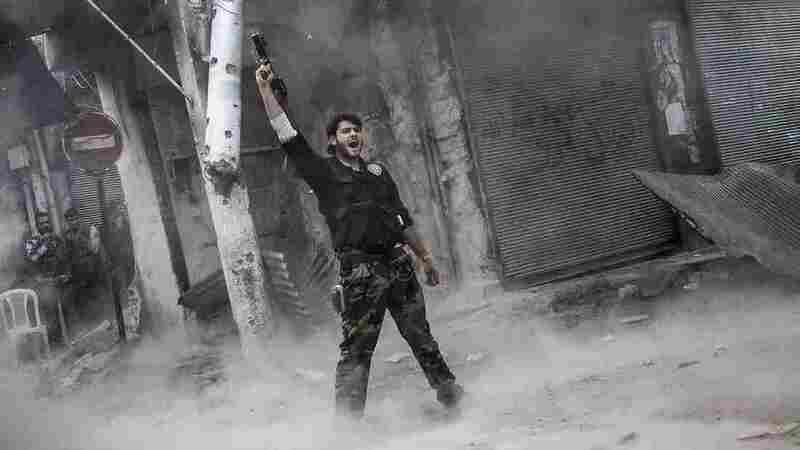 A rebel fighter raises his weapon after firing a missile Sunday toward Syrian government troops in the northern city of Aleppo. Syria's largest city has been the scene of heavy fighting for the past three months. Both sides control part of the city, and the fight has been a stalemate recently. A U.N special envoy says fighting is so entrenched in Syria that it could face 'Somalization'. Violence continues in Syria, after car bombs blew up and fighting continued in Damascus and other Syrian cities on Monday. Today, gunmen shot and killed the brother of the speaker of Syria's parliament. Mohammad Osama al-Laha was killed when he was driving to work, according to Syrian state media, which blamed terrorists for his murder. It's the latest in many acts of widespread violence that led U.N. envoy Lakhdar Brahimi to lament, "I believe that if the (Syrian) crisis is not solved in a right way, there will be the danger of Somalization, " reported AP. "It will mean the fall of the state, rise of war lords and militias." Somalia hasn't had a full central government since 1991, notes the BBC. The same fear is echoed by Nobel peace prize winner Jose Ramos-Horta, who helped bring independence to his home, East Timor. He recently visited Syria and warns the Syrian government will fight simply for the survival of President Bashar Assad; he alleges the Syrian rebels are not democratic, according to Al-Arabiya. "Anything, anything, to get that man out of the country and to have a safe transition in Syria. Of course I would favor him facing the full force of international law and justice for what he's done. I am certainly not offering him an exit plan to Britain but if he wants to leave he could leave, that could be arranged." "After Syrian government forces have indulged in a massive campaign of indiscriminate bombings, mass round-ups and torture, there should be no question of Bashar al-Assad escaping justice with a cosy deal of this kind." Cameron is traveling to Saudi Arabia; the Guardian reports the British foreign office issued a statement today, saying the prime minister hasn't talked to others about how Assad might leave Syria, and that Cameron's administration is clear that Assad must face justice while Syrians must choose their own new leaders.